AltspaceVR is a small virtual reality company that wants you to communicate with friends and family as a virtual avatar, kind of like a 3D version of Skype. But around this time last year, the company decided to take that idea a step further—it wanted to bring Dungeons & Dragons to virtual reality. Now it has. What started as a rough idea that spawned out of a 48-hour game jam now has the full backing of Wizards of the Coast, the nerdtastic company that owns Dungeons & Dragons and the mega-popular card game, Magic: The Gathering. “It was me and a couple other engineers who looked at each other and said, ‘D&D, it has to happen,’” says Bruce Wooden, AltspaceVR’s head a developer relations. From there, Wooden says, the idea caught on quickly, with testers unwilling to take off their Oculus DK2 headsets for upwards of five hours. The system was simple back then, but has grown in complexity since. Each player is represented by a virtual avatar and plays on a virtual game mat, like in the image up top. One panel is a simple browser so players can quickly reference web resources while they’re playing and a bar above allows players to access different dice needed to play. The Dungeon Master, like in the game itself, has a few more superpowers like playing scene-setting music or moving tiles for different battle scenarios. Of course, Dungeons & Dragons isn’t prone to simplicity with its stats, upon stats, upon stats. You could almost summarize D&D as “fantasy math,” but Wooden says the integrated 2D web browsers makes things a little simpler. Meanwhile, option menus for quickly setting up a game board and other windows that easily show die rolls to the whole group help make the program less confusing and awkward. 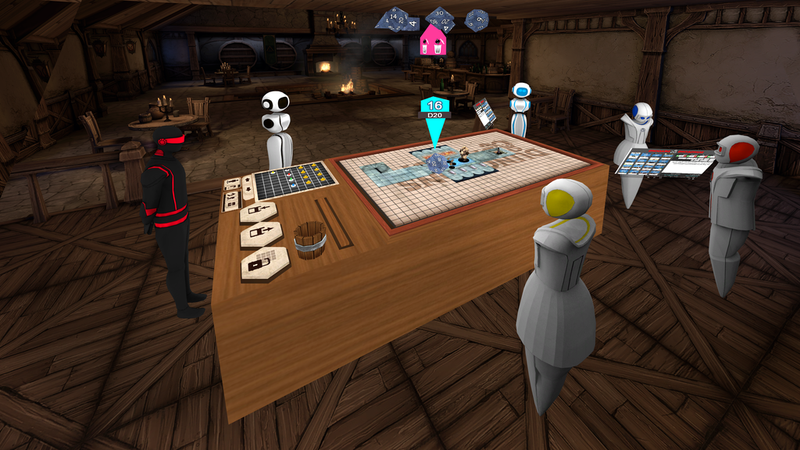 Wooden says that this software version is the “first step” for AltspaceVR and Wizards of the Coast, giving the “20V” project access to information and monster art to make the app feel more official. But this isn’t your dad’s D&D: This app is based of the latest edition of Dungeons and Dragons released in 2014. The app is currently designed to work with the Oculus Rift DK2, so really the biggest challenge to starting up your next virtual D&D session is making sure your entire party is as big of a VR enthusiast as you are. But with the commercial version coming sometime in early 2016, it may not be much of hurdle for long. Of course, D&D could just be the beginning. Other communal VR experiences could include tons of different board games or even card games, since apps like Hearthstone have proved that card games can survive and thrive after going digital. And since Wizards of the Coast does own another hugely popular gaming franchise, could Magic: The Gathering VR be in our near future?